Will Gold have a place in the next international monetary system? That was a question being asked in the 1970s and one that has risen to prominence in the last half a decade following the global financial crisis. Until 1971 most currencies were tied to the US Dollar, with the Dollar then linked to Gold at a fixed price. When the US closed the Gold window all currencies were left without a stable reference point. The way we value fiat currencies today is like measuring the distance between boats drifting aimlessly on an ocean, they are tied to each other with loose ropes, but have lost sight of the shore. While it doesn't have an official role in the international monetary system today, Gold is held by many central banks to diversify reserves and an asset of last resort. Central banks have added to positions over the last half a decade (turning into net buyers). While it's impossible to know with any certainty what the future may bring and whether the replacement for the existing international monetary system, currently dominated by the US Dollar, will involve Gold, there is plenty of interesting reading available for consideration. Below are just a few of the high profile people who are expecting or are recommending a change to the international monetary system, while dropping hints that it should include Gold. In my opinion he took the proposal as close to saying 'Gold backed SDR' as he could without using those words explicitly. The developing and emerging market economies need to have more say in major international financial institutions including the World Bank and the International Monetary Fund, so that they could better reflect the transformations of the global economic and political landscape. What may also be included as a key part of an effective reform is the introduction of a new international reserve currency that is to be created to replace the dominant U.S. dollar, so that the international community could permanently stay away from the spillover of the intensifying domestic political turmoil in the United States. China and emerging markets will be key players in any global agreement on a new system. Steve Forbes, twice a nomination for Republican candidate (to run for president), Chairman and Editor-In-Chief, Forbes Media, has been publicly expressing his expectation for a return to the Gold standard for several years. I'm not sure that such a simple operation would work as described. For example assuming that existing leveraged paper Gold markets continued to operate, presumably there would be incentive for large investment banks to push around the price of Gold, in turn manipulating the actions of the Fed. Such a system would need to see the paper/futures markets dismantled and the central banks taking control of the physical market by selling amongst each other at far higher prices (perhaps in an agreed value range). From my reading of Steve Forbes articles, he leans toward a return to sound money in general and suspect he would support an international monetary system based around Gold even if it wasn't only the US returning to a form of Gold standard. The system should also consider employing gold as an international reference point of market expectations about inflation, deflation and future currency values. Although textbooks may view gold as the old money, markets are using gold as an alternative monetary asset today. The development of a monetary system to succeed “Bretton Woods II”, launched in 1971, will take time. But we need to begin. The scope of the changes since 1971 certainly matches those between 1945 and 1971 that prompted the shift from Bretton Woods I to II. Serious work should include possible changes in International Monetary Fund rules to review capital as well as current account policies, and connect IMF monetary assessments with WTO obligations not to use currency policies to remove trade concessions. ...But what the response signified to me is, in a sense, the core point, which is that there is uncertainty about the future of the international monetary system. As I said, whether people wish to acknowledge it or not, you're moving towards a Bretton Woods III. My view is that it's important for policymakers to specify what is happening in the markets so that you can have a better discussion about how to steer the direction of Bretton Woods III. I've touched on again this morning that I think you're going to move to a system where you've got multiple currencies. I think the dollar, U.S. dollar, will remain dominant, but people will look at alternative investment sources. The future strength of the dollar depends critically on the strength of the U.S. economy, and that brings you right back to the growth strategy. So, what I felt was--I think the part that was missing in the discussion was there's this tendency for people to talk about rebalancing, which is current aggregate demand, then people talk about exchange rates, but they're not connecting the dots. And to me, the key part in connecting the dots is growth, and where gold fits in is it's--as Lionel said, it's the yellow elephant in the room--is that, you know, people may not like the idea of intentional growth, but it's already happening, and markets are already using gold as an alternative monetary asset. Why is that so? Because confidence is low. Despite his slight backpedal, it seems obvious that Zoellick already sees Gold as an international reference point and there is probably a lot more being left unsaid. ...But I do not think that we will see the time when either of those two great economic powers, the United States and the European Union, will ever again fix their respective currencies to gold as they have in the past. More likely, gold will be used at some point, maybe in 10 or 15 years when it has been banalized among central bankers, and they are not so timid to speak about its use as an asset that can circulate between central banks. Not necessarily at a fixed price, but a market price. The more countries start to think about gold as an index, as a warning signal of inflation, the more the monetary authority will try to keep the price of gold from rising. Imagine that tomorrow the price of gold rises form $350 to $400. Don't you think that immediately the Fed will see that as a signal of an increase in inflationary expectations and the need to tighten? ...Gold is going to be a part of the structure of the international monetary system for the 21st century, but not in the way it has been in the past. We can look upon the period of the gold standard, the free coinage gold standard, as being a period that was unique in history, when there was a balance among the powers and no single superpower dominated. A single unit for quoting prices. A common unit for denominating debts. A common rate of inflation for participating countries. A common interest rate on risk-free assets. Pimm Fox: You’ve written about the role of gold in the world economy, Professor Mundell. Do you think that we’re going to see any kind of return to the gold standard? Mundell: [T]here could be a kind of Bretton Woods type of gold standard where the price of gold was fixed for central banks and they could use gold as an asset to trade central banks. The great advantage of that was that gold is nobody’s liability and it can’t be printed. So it has a strength and confidence that people trust. 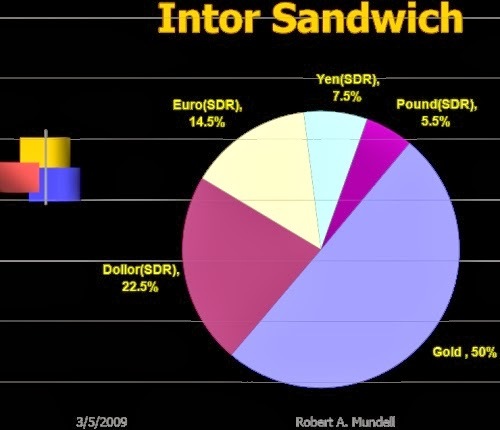 So If you had not just the United States but the United States and the euro tied together to each other and to gold, gold might be the intermediary and then with the other important currencies like the yen and Chinese yuan and British pound all tied together as a kind of new SDR that could be one way the world could move forward on a better monetary system. Mundell's plan for a European currency date back to 1969, here's hoping his predictions for a Gold based international monetary system don't take 30 years to eventuate. In the present conditions, it is crucial to support calculations and pricing in multiple currencies whose issuers comply with international requirements. These should be applied to the level of economic and financial system development, budgetary and monetary policies, investment control and financial operations. - Enlargement (diversification) of the list of currencies used as reserve ones, based on agreed measures to promote the development of major regional financial centers. In this context, we should consider possible establishment of specific regional mechanisms which would contribute to reducing volatility of exchange rates of such reserve currencies. - Introduction of a supra-national reserve currency to be issued by international financial institutions. It seems appropriate to consider the role of IMF in this process and to review the feasibility of and the need for measures to ensure the recognition of SDRs as a "supra-reserve" currency by the whole world community. The obligation to diversify currency structure of the reserves and operations of national banks and international financial organizations should also be provided for. In our view, it would be appropriate to submit the results of those studies to the Ministers of Finance and Presidents of the Central Banks of the G20 States with a view to define the most efficient additional steps to harmonize the existing national monetary policies and to implement an efficient reform of IMF. We also believe that discussion of the elaborating harmonized rules of "clearing" transborder debts, including by way of coordinating the actions of countries "representing" creditors and debtors, can be launched as part of our action on countering financial protectionism. A lot of work still remains ahead in the world's efforts to build a fair, efficient global financial system, Chinese and Russian experts say. Experts from Beijing and Moscow on Thursday held a video conference to discuss the possibility of creating a "supra-national reserve currency." Creating a "supra-national reserve currency" suggested by China on the eve of the London G20 summit is a long-term idea, said ChenDaofu, an expert with the Development Research Center of the State Council of China. Russia supports expanding the IMF's Special Drawing Rights (SDR) to include the rouble, the yuan and gold, but sees no chance of the G20 Summit accepting a new reserve currency, a Kremlin aide said on Saturday, agencies reported. "It would be logical for the set of currencies (that make up the SDR) to be expanded, and it could include other currencies, including the rouble, the yuan and perhaps others,"
Supranational currency is an even bigger topic. In order for it to work, all governments need to be unified in this cause. We have already talked about it at G20 meetings, and we understand that if we use the financial instruments currently being suggested by the International Monetary Fund (taking into account the volume of money, including national currencies, that pass through the IMF, this money will be used, among other things, for SDRs), we will most likely see the creation of a supranational currency, or a substitute thereof, which will be used, to a limited degree, in international payments. Now with regard to currencies: this issue has already become a regular feature at these meetings. Although even a few months ago or, say, at the first summit in Washington, it was hardly discussed, I did raise the issue of international reserve currencies at [the G8 summit in] Toyako in Japan. But it must be said that the economic situation was not a great concern for many of the participants. They thought that we'd avoid the worst. And now the topic has become a constant one. 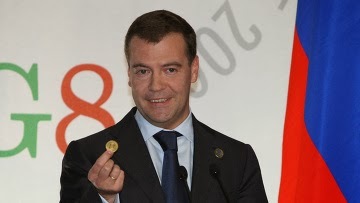 We are always discussing the creation of new reserve currencies or, to be more precise, the emergence of new reserve currencies, including the possibility of the ruble as a currency, even if that is not reflected in our statements, as well as the issue of a supranational currency. Incidentally, on this occasion I can cheer you up because I have in my pocket a supranational currency, which someone gave me as a gift. This is one unit of it, a sample featuring the motto “Unity in diversity,” and it is called a “united future world currency.” It is already possible to see and touch it. What does this mean? Of course, this is just a gift, a sample version, but something like this is in the works and may appear one day. You will be able to hold it in your hand and use it as a means of payment. There is even a special standard and rules concerning its use, but it is a symbol of our unity, of our desire to jointly address such issues. So here it is, an international currency. Little more has been said by Russia since this time. Perhaps as markets have settled since the GFC (at it's height around time of above comments) it's been deemed there's less need for such proposals or maybe Medvedev was told to keep quiet after hinting at the conference above that something is 'in the works'. Russia, although mostly silent on Gold and a new international currency (since 2009), has consistently added to their Gold reserves over the last several years. A saying comes to mind, 'actions speak louder than words'. FOFOA is a blogger (can be found here) following on the heels of Another and FOA. In a previous post I provided a brief introduction to Freegold which is the primary topic of the blog. The current $IMFS is backed by collateral. The ultimate collateral in this system is sovereign debt - the risk-free asset in the banking system against which all other assets are priced. This sovereign debt was always worthless because sovereign debt has never been repaid. (England being the sole exception and that was hundreds of years ago.) So, at some point, the system will need to be recapitalized with collateral that is NOT worthless. Real estate IS big enough to back the new regime but it isn't an option for several reasons. (One, because it's already mortgaged to the hilt.) Oil is also big enough but it isn't an option because that's what underpins the current US dollar-based system. Apparently an oil-backed Euro was envisaged some time ago but that appears to be a no-go today IMHO. Gold is the only remaining option. 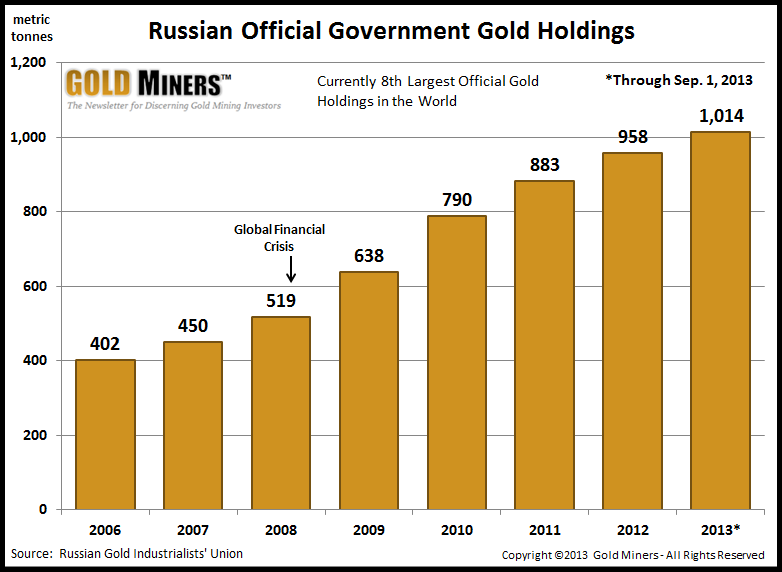 Now you could simply adopt gold as the new risk-free asset and make the sovereign debt obviously worthless. A dumb move that would please the gold bugs (and no one willingly rewards stupidity except voters). TwoShortPlanks is another blogger (found here) with a somewhat different take (primarily writes about a future with a Gold backed SDR). Like FOFOA he dips into conspiracy territory with his opinions and has a very high estimate on where Gold is heading, but many of the points put forward are compelling. So what would come next? Well, if you go down the line of currencies around the world, you don't find many attractive opportunities. And that's why I say if the world were to give up on dollars and give up on euros, they'd probably go back to the old standby, which is gold. And I don't mean by gold, government run gold standard, like we had in the late 19th century. That's politically impossible. Governments will never be willing to subordinate their policies to the constraints of a hard commodity ever again... So how could gold make a revival as a sort of international money? Well, we don't actually need a government run gold standard anymore...since people have always had confidence in gold as a long-term store of value, there's no reason why it couldn't play that role. It was well understood before the Bretton Woods era that monetary nationalism would fundamentally change the way capital flows naturally operate, making of a benign economic force one which would necessarily wreak havoc with flexible exchange rates. But that understanding has been all but lost. The global monetary order that has emerged since the 1970s is now globalization’s greatest source of vulnerability. Capital flows have come to be seen as inherently destabilizing, and the anti-market animus this perception encourages will only grow more potent as currency crises recur, or governments resort to ever-more draconian interventions in the working of the price system in order to forestall them. What is to be done? An effective cooperative solution is difficult to imagine. The genie of fiat money cannot be put back into the bottle. Realistically, therefore, “sauve qui peut” is the message for nations whose currencies are not wanted by foreigners. Dollarization— abandonment of parochial currencies in favor of the dollar, euro, or other internationally accepted money—is, in a world of fiat currencies, the only way to globalize safely. Of course, the status of global money is not heaven-bestowed, and there is no way effectively to insure against the unwinding of “global imbalances” should China, with more than a trillion dollars of reserves, and other asset-rich central banks come to fear the unbearable lightness of their fiat holdings. Digitized commodity money may then be in store for us. As radical and implausible as that may sound, digitizing the earth’s 2,500- year experiment with commodity money may ultimately prove far more sustainable than our recent 35-year experiment with monetary sovereignty. In 2007 Professor Fekete noted that the marginal utility of debt had fallen to below zero. This simplistically meant that for every new dollar borrowed into existence, the borrower was receiving less than what that dollar cost to borrow. This was an indication of a debt saturation point. The level of debt incurred was so great that markets could no longer support the issuance of further debt. We are all aware of the events that followed. Yet it should be noted that the destructive forces of default and bankruptcy, which tore through the financial centres across the globe (only to be temporarily postponed by fierce central bank intervention), were in fact the only mechanism available to the markets to extinguish the aggregate level of debt. This is the sinister and lethal method in which debt can be extinguished under an irredeemable monetary syst em, which ironically would have probably meant the entire destruction and disintegration of the monetary system. All debt will eventually be extinguished. The academic argument of the manner in which that debt will be extinguished is of economic and moral significance. The choices are bleak. If gold isn’t brought back into the system and markets remain constrained with regulations, the irredeemable monetary system as well as the civilised world will collapse, as that is the only way possible to extinguish debt. Alternatively if gold resumes its role as monetary supreme, catastrophe may be averted, though it will still be a bitter pill to swallow. Gold is the ultimate extinguisher of debt. The reason is that gold enters the asset column in the balance sheet of banks but, unlike every other asset, it has no corresponding entry in the liability column of the balance sheet of someone else. Gold survives any consolidation of balance sheets. Other assets are wiped out when the balance sheets of debtor and creditor are consolidated, as in default and repossession. I am sure there are many other prominent and great minds that have come to a similar conclusion, that Gold above all else could be the solution to a new international monetary system. The good news is that there's really no need to buy Gold specifically for such an event (should it occur), simply having a conservative position in Gold (advice varies, but often ranges between 5-25% of your investment capital) will likely set you up with a favourable gain should any monetary system involving Gold eventuate. 'Resets' are events, they're not gradual processes. You don't gradually reset the financial system. 'Better three hours too soon than a minute too late' is another quote that comes to mind. If you think a new international monetary system is likely and will include Gold at it's core, then you'd best be prepared now, not later (amongst the many other reasons to hold the metal). "We are viewing events from an 'internet time' perspective, which makes even a modest 10 year collapse/transition process seem like a lifetime." I still think that decades of deleveraging are unlikely to play out, so transition to a new monetary system is likely to occur within the next 5-10 years. Although that certainly doesn't exclude the possibility of Gold and Silver heading into a bubble while the current monetary system remains intact. As I've said on the blog in the past, it's my opinion that precious metals are in a cyclical bear market, forming part of a continuing secular bull market that will resume in time.